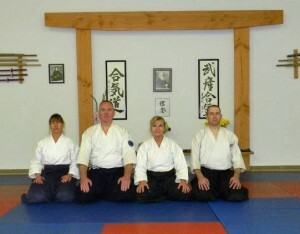 Over Memorial Day weekend, a few of us from Kiryu Aikido headed to Santa Fe to take part in a two-day seminar led by Patricia Hendricks Sensei 7th dan. Hosted by Jerome Buenviaje Sensei and his students at Takemusu Aikido New Mexico, the seminar drew nearly two dozen students from dojos in Colorado and New Mexico. 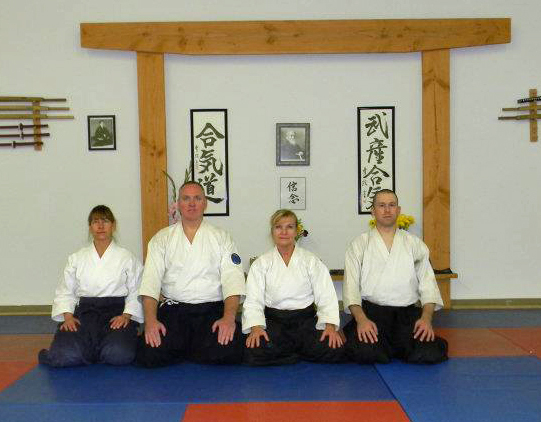 Perhaps the timing of the holiday weekend prevented more attendees, which was highly unfortunate, because this was a rare chance to train with Hendricks Sensei, whose strong, clean, powerful techniques underscore why she recently received her 7th Dan from Doshu at Hombu Dojo. 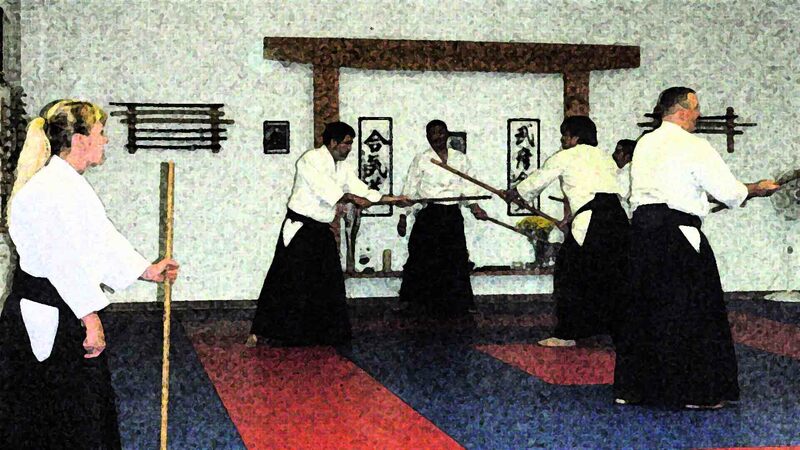 Over the four hours of practice each day, Hendricks Sensei shared her strong Iwama open hand and weapons techniques. It’s very challenging to write about the technical specifics she taught, so this post will focus more on other aspects of the seminar. However, for each technique–whether open hand or weapons–she broke it down into pieces that were easier to apply and gave pointers to every student at some point over the weekend. Hendricks Sensei is demanding in wanting perfection and having high standards for quality Aikido, yet she is kind in her delivery and so willing to help. She focused on a lot of basic techniques, and at one point she said that O-Sensei taught basics every class because they are so important. And just because a technique, like Tai No Henko or Morote Dori Kokyu Ho, is kihon (basic) doesn’t mean it is easy or that it doesn’t have many layers that take years to start to understand. Part of the benefit of going to seminars, in my opinion, is to learn from another teacher and open our eyes and mind to how and what they are teaching. Brain fry is a natural result of doing one’s best to overcome ingrained habits and muscle memory to do the technique the way the teacher is showing it. It’s challenging, but that’s why we’re there–to learn and let go of what “we know.” Otherwise, why bother going to a seminar if we’re just going to practice the way we always practice? 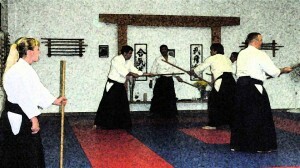 We did about half open hand and half weapons, including techniques from Katate Dori, Ai Hanmi Katate Dori, Yokomen Uchi, Tsuki, and Ryote Dori, and weapons work with suburi, Kumi Jo, Kumi Tachi, and Ken Tai Jo. 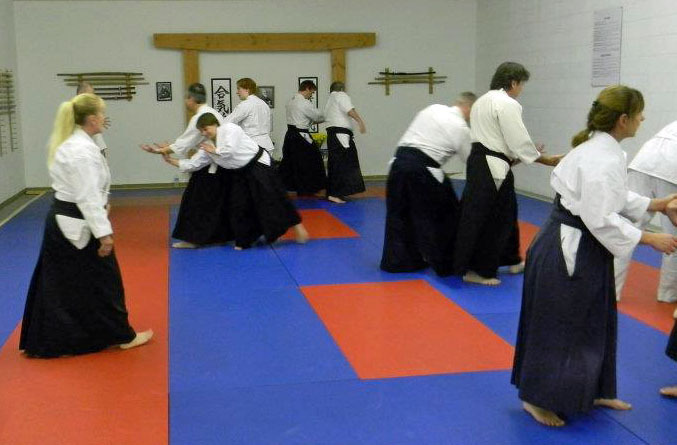 While we practice Iwama style weapons in our dojo, there are differences in kamae and suburi that make things fun (more challenges!). Hendricks Sensei provided hugely valuable assistance with tailoring techniques for smaller people, and she also asked for questions, whether they were technique related or historical. After she answered each question, she thought of a way to have us practice that technique or idea. For example, the topic was avoiding injury, and she said that many students over the age of 70 train at Hombu every day, week after week, year after year. To illustrate this, she has us practice Kotegaeshi as if we were 70–flowing, moving, using our center. Another question was about the average class size at Hombu. Answer: crowded…between 40 and 100 students. So, we practiced one-mat techniques, using only one tatami for each Nage and Uke. You can get a lot of Aikido done in the space of one tatami! ** How to avoid injury, or to heal from injury, which seem more common the more you train and the more you progress: listen to your body. When it has certain areas that are prone to injury, what is it trying to tell you and why are you holding on to that pain? You can do a lot of work to consciously release that pain and let go of it. Hendricks Sensei said she had a lot of injuries in her early years of training but now physically feels better than she did back then. Why? Because she listens to her body and works with it and the lessons it is trying to teach her. ** Practice intensely in class…and then let it go. Forget what you learned in your head; your body will remember it. ** As soon as you tell yourself “I don’t get this technique,” you lose. Assume you will get it and do it well. ** See the situation from our partner’s perspective. Tai No Henko is a perfect illustration of this. ** Ground yourself, as Uke and as Nage. Sink into the technique. Kiai. After the last session on Saturday, Buenviaje Sensei and his students invited everyone to a potluck at the dojo. The food was great and those who stayed had good conversations with new friends. Many thanks to Hendricks Sensei for her gifted teaching and her generosity sharing her passion for Aikido with all of us, and to Jerome Buenviaje Sensei and his students at Takemusu Aikido New Mexico for their hospitality and welcoming spirit. We look forward to practicing with you all in the future!